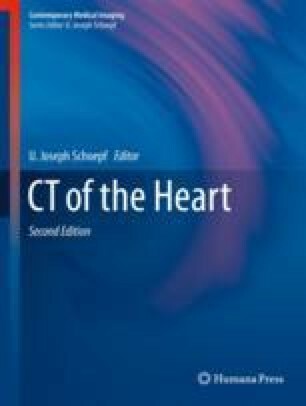 Multidetector coronary computed tomographic angiography (CCTA) is a useful tool for diagnosing and evaluating coronary artery disease, as well as elucidating mediastinal anatomy pertinent to coronary artery bypass grafting (CABG). Multiple developments in hardware, software, and technique have contributed to improved spatial and temporal resolution while imaging the heart, giving high-quality information on native coronary arteries and bypass grafts. While CCTA is not routinely used as a sole test to proceeding with CABG, it provides more information on mediastinal anatomy than ICA and is indispensable for minimally invasive CABG and off-pump CABG and for evaluating potential arterial grafts for all-arterial bypass. In addition, CCTA has been shown to accurately assess coronary artery bypass grafts for stenosis and overall patency, in both venous and arterial grafts. CCTA is indispensable to reoperative surgery in determining the location of bypass grafts and other mediastinal structures in order to avoid damage during sternal reentry. The current status of multidetector CT (MDCT) for use with CABG is promising, and advances in newer-generation CT scanners may lead to it becoming the “gatekeeper” to the catheterization lab and the operating room.